In the midst of the current ecological crisis, there is often lofty talk of the need for humanity to ‘overcome its divisions’ and work together to tackle the big challenges of our time. But as this new book by Razmig Keucheyan shows, the real picture is very different. Just take the case of the siting of toxic waste landfills in the United States: if you want to know where waste is most likely to be dumped, ask yourself where Blacks, Hispanics, Native Americans and other racial minorities live and where the poorest neighbourhoods are. This kind of ‘environmental racism’ is by no means restricted to the United States: it is very much a global phenomenon. Keucheyan show how the capitalist response to the crisis has been marked by a massive expansion in ‘environmental finance’. From ‘carbon markets’ to ‘pollution permits’, ‘climate derivatives’ and ‘catastrophe bonds’, we are seeing a proliferation of nature-related financial products. Instead of tackling the root of the problem, the neoliberal strategy seeks to profit from environmental risks. Moreover, with the rise in natural disasters, resource scarcity, food crises, the destabilization of the poles and oceans and the prospect of tens of millions of ‘climate refugees’, Western powers are increasingly adopting a military response to ecological problems. The Cold War is over: welcome to the ‘green wars’. From New Orleans to the Siachen glacier via the Arctic floes, Keucheyan explores the landmark sites of this new ‘climate geostrategy’. Through a sharp critique of the way capitalism responds to environmental disaster, this innovative book provides a fresh perspective on some of the most critical issues confronting our societies today. Razmig Keucheyan teaches sociology at the University of Paris IV-Sorbonne. The end of conventional wars? "We now have an eloquent new perspective on the crises of our time, illuminating the multiple links and intricate relationships among inequality/racism/globalization on the one hand, and the capitalist, financial, and military elites that drive them, on the other, all of this mediated by their multiple connections to the state and nature. 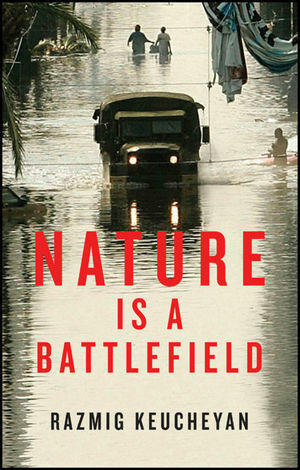 Nature is a Battlefield is essential reading for understanding the next fifty years."